Holds SUPs up to 100 lbs! This is our galvanized weather resistant outdoor storage solution for saltwater environments, exactly where you need store your paddleboard! Saltwater Resistant. The SUP rack is made of heavy duty, galvanized steel and comes with stainless steel mounting hardware, making it the right choice for storing your paddleboards at the water's edge, on your dock, deck, pier or marina, saving you from lugging them around. For outdoor rust-resistant paddleboard storage, look no further. What SUPs does it hold? Weight: the rack's monolithic, tubular steel construction allows you to store SUPs up to 100 lbs! Thickness: the U-cradle of the rack is 8" wide, so you can store wider touring and race SUPs in the rack, too. Length: mount the arms are far apart as you need to fit the length of your SUP. Have 2 SUPs? Here's this rack for 2 SUPs! Supension Strap System. The Suspension SUP Wall Rack is a unique stand up paddleboard wall rack because it will store your board with zero pressure points. These suspension straps conform to your board's geometry and are what allow this rack to not create any pressure points on your board - awesome! Safety Tie Down Straps. The SUP rack has built in, adjustable safety straps to ensure your SUP stays securely in place. This keeps your SUPs secure when they're stored outdoors in a windy spot or if you're afraid someone might bump into your board. Hey! 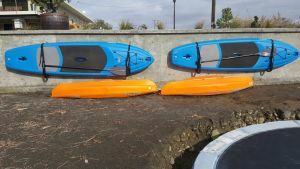 This is Josh from StoreYourBoard.com, here today with the Outdoor SUP Wall Rack, perfect for marine environments, saltwater, freshwater, anything outdoors. Super heavy-duty rack, very simple. Just these two racks. It’s made from steel, galvanized steel, and it’s powder-coated on top of that, so really, really great protection for saltwater, freshwater, anything like that. You can use it on dock, deck, a patio, even in the garage area where you don't have humid moist there. Like I said, it comes with these two racks. You can see it hanging behind me with a paddleboard. Here’s the first one. Here’s the second one. Put front and back. It stores really nice and compact against the wall and also very secure. I’ll show you a couple of features here. This top part is made as an extra securing strap. You can see that right up here. You don’t need to use that, but in a windy condition, it’s something where you just want to make sure the place is secure. You can use that. The bottom straps are actually a suspension system where it’s really nice to be able to just contour any board shape that you have for paddleboards, and it won’t be hitting the metal. It won’t be rested on that, so it will keep your board in pristine shape. It is 10 inches wide between here, so that should fit majority of paddleboards on the market. maybe you’re very, very big but 8 inches wide. It should fit fine. It sticks out from the wall at 10 inches, so like I said, pretty compact. For most boards, you can fit the fins back. This board has a couple of fins on the back, and it fits fine without. If you have a wider board and you have a longer fin, you can just flip your board around and face the fins out. No problem at all. Like I said, we have our strapping, so I’m just going to unstrap that. With this suspension system, it’s just kind of resting that cradle nicely so, if you could see it, it rests perfectly fine without all these straps, so you don’t need to do that every time, but when you’re away for a while or if it’s windy, something like that, you’re going to want to use that. The board just slips in an out. I’ll show you how to do that. Just like that. Here you can see, two pieces that are coated with the straps. Like I said, this is an awesome outdoor rack, great for your deck, for your dock, for your patio. Check it out at StoreYourBoard.com, the Outdoor SUP Wall Rack. Can I mount these on the poles of my dock? Our galvanized SUP racks should be fine mounted to wood dock poles, and you should be able to do that with their included hardware. If they are not wood but another material, such as concrete, you would need to buy additional mounting hardware from anywhere you buy hardware (Lowe's, Home Depot, etc.). Can I mount these racks to the stations on my sailboat. I would use the type of clamps used on marine plumbing to keep hoses from coming off. Would that work? Or what else would you suggest for mounting to aluminum stations? We can't recommend that alternative mounting as viable for this galvanized Suspension Cradle SUP Rack, as it isn't the use or mounting it was manufactured and tested for; however, what you are thinking of doing is similar to the way this Sailboat SUP rack works, which includes the clamps to attach to your boat's stanchions. We just can't say trying to mount the suspension cradle rack that way could work well, or what issues you may run into, so that sailboat rack may be an alternative to consider since its intended for that use. Is there a mount for a stainless bow rail? To store SUP on a yacht? We have a couple of SUP mounts available for different types of boats, including this stainless steel rail mounted SUP rack (available to fit one or more SUPs). It has mounting brackets that are designed to fit straight and tapered, vertical or diagonal boat rails from 7/8” (22 mm) to 1-1/2” (38 mm) diameter (great for stanchions or bow and stern pulpits, too). We have some additional options found in our listings for SUP boat racks. Do you offer a way to lock the board in place? Our dock is located at a busy spot on the lake. Yes, we have options for locking your board! These SUP dock locks work well; they attach to either the leash plug or fin box of your board, then you can loop the cable around the rack or other fixed feature to secure your board. Additionally, if you need to secure more than one board, additional jaw clamps are available, so that you can use one cable to secure several boards at once. They are versatile to use when transporting a board as well (to secure to a roof rack, say). I saw these racks mounted to the steel frame of a dock gang in another picture on your site. Does it come with these mounts/clamps or are they sold separately? These galvanized SUP racks come with hardware for mounting to wood posts/beams, but do not include hardware to attach it to other materials such as steel You would need additional mounting hardware for that, which would be available from anywhere you normally buy hardware. I am excited that they are marine grade, and hopefully won’t rust. Easy to install. Works great. Only suggestion would be to adjust design so holes for mounting screw are not directly behind the turn up of the bracket. Can't get screw driver on there easily. I have a place on the beach and didn't want to carry my SUP up/down stairs. My solution was to use these galavanized storage brackets mounted to two 4x4 posts on the beach. This allowed me to walk up the beach and place it in the rack mounted rack approximately 12'' off the beach(bottom of rack) w the least amount of effort and potential back issues allowing me utilize SUP more often. With the board suspended in the straps it has less potential of damage, great product! The lock is mounted w a thru bolt thru the post for security. This rack is very well designed so that your board rests only on the straps while in the cradle. Other designs allow the board to rest against the metal and bang around causing potential damage to your board. Not mentioned is that the metal is all powder coated over the galvanizing. So this ought to last longer than your board. I like the strap concept rather than resting directly on the racks. Gives it a little more flexibility in how to store your board. We wanted something that would secure our SUP boards and make them easily accessible to the water. No one enjoys dragging them down to the water for each use and then having to drag them back to storage! This will also encourage us to use them more. The racks are simply made and sturdy and easy to use. An added benefit is having a way to lock them up. These are sold as wall racks so we improvised by adding to our pier. Check out the pics! Had a handy man put them up with no trouble. Time will tell if the rust. I hope not! These worked out great for us. I am very pleased with this rack. It is really strong and works perfects mounted on the side of our boat house. I have been looking for a way to get me board out of the way and safely stored because as we all know dock space is precious.